Hi my name is Millie Audrina Rose and I am 6 years old and will be going into the 1st grade. My start to gymnastics is actually a pretty funny one. My mom used to be a Level 10 competitive gymnast and during college, after one of her competitions, she said she felt off and tired so she went to the doctors. Come to find out she was pregnant with me! So technically I've been doing gymnastics since I was in my mom's belly! 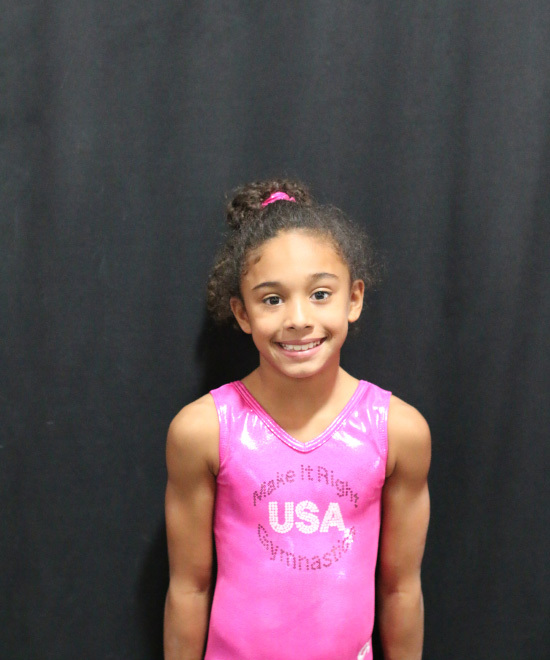 I started competing when I was 5 and completed the Level 2 season 2013-2014. Over the summer I tested out of Level 3 and now I will be going into Level 4 for the 2014-2015 season. I'm really good at jumping on the pogo stick. I love to dance and sing and make up routines. I love to make dinner for my mom & dad. I have a dog named Music, two fish named Lightening and Tealy, and a Turtle named Betsey 2. I was an extra in the movie Goldbrick in 2013 and Guard Dog 2014.